It is also known as working capital/circulating capital. Eg raw materials, electricity, fuel, coal etc. 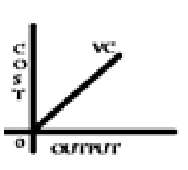 The cost of variable capital varies directly with the output ie when output is nil, the variable capital will be zero. As output rises variable capital will rise and as output falls variable capital will fall. Variable capital can be completely recovered with the sale of output.use but appears in another form, shape, structure etc. in the output. Eg cotton transforms into yarn.